The stress of caregiving can strain even the best sibling relationships and worsen already tense ones. But working together as much as possible spreads the workload and gives more support to parents and the primary caregiver. To help you work better as a team, Caring.com shares expert tips on managing family dynamics while caring for a parent with dementia: moving past old expectations, dividing the work, sharing information, checking in regularly, and more. Siblings have a “strength in numbers” advantage over only children when a parent develops Alzheimer’s – but for every additional family member in the mix of caregivers, there’s also an increased chance of communication snafus and discord in decision-making. It’s a blessed but rare family where everyone is in agreement about every decision pertaining to a parent’s care. Differences of opinion are liable to crop up on any number of issues, large and small. This is only logical because although you might have been born into the same family, you each have different personalities, life experiences, and relationships with your parent. Your age, marital situation, birth order, financial history, and a hundred other details inform how you see a situation. And everyone brings this baggage to the difficult situation of caring for an ill parent. Accepting that there will be disagreements is the first step in getting along better. You may win some, you may lose some. There’s rarely one right way to handle things. The primary goal is that something gets done. The typical dynamic in a family crisis is for adult children to revert to their childhood roles and perceptions. Be aware that sometimes the damage is self-inflicted, and we limit ourselves by slipping into our childhood roles or seeing through the lens of family history. Another inadvertent expectation is gender stereotyping. It’s not necessarily the daughter to whom care should fall, while the son handles the money. Remember that you’re all grown-ups now, and that puts you on an equal footing. Everyone involved should have a say in what transpires. If you see someone getting left out, lightly point out that it’s happening and help everyone correct course. If it’s your parent who clings to rigid expectations from the past, it’s important for all siblings to gently set him straight. It’s virtually impossible for a single individual to provide Alzheimer’s care for the duration of the disease. That’s because 24-7 care is extremely stressful, and becomes more so as the disease progresses. If you’re the sibling who is the primary caregiver, provide candid appraisals of the situation for your brothers and sisters. Learn how to ask for help; often family members don’t volunteer because they aren’t sure what to do and from a distance can’t see how taxing Alzheimer’s care can be. If you’re not the primary caregiver, it’s important to support the person who is, in words and deeds (and dollars, if possible). Caregiver burnout is a leading reason people with Alzheimer’s move from a home to a nursing facility. Don’t assume everything’s going fine: ask, visit, call. Alzheimer’s is not a onetime problem to solve; because it’s progressively debilitating, your parent’s situation (and the kind of help she needs) can change from month to month or year to year. Rather than having everyone involved in every step of the care process, consider the “divide and conquer” approach. Talk over each family member’s skills, strengths, and life situation. A sibling who lives far away or who is a single parent shouldn’t be expected to make exactly the same kind of contributions as one who lives next door to the parent, for example. One sibling may be most suited to discussing your parent’s condition with medical personnel because he works in medicine or has had other firsthand experience with a medical crisis. Another may be more comfortable providing hands-on care, researching housing options, or working through financial and insurance matters. Some families worry about placing a disproportionate burden on one sibling. That can happen to some extent; the person doing hands-on primary care has the toughest task. If one sibling feels resentful of doing more than the others, or feels guilty that she’s doing less, there are ways to even things out. These might include financial contributions, providing relief care, or rotating schedules for care. Putting key information in writing gives everyone access to the facts, while also leaving a paper trail in the event of disagreements later. Ideally, hands-on caregivers use e-mail to CC everyone at the same time. Even if you’ve all been in on a conversation, it can be helpful to have a written record afterward. If you’re the primary caregiver, sound out your siblings on the depth of information they feel they need. While regular updates are important, they may not care to receive a daily report about diet, activities, and so on. Don’t communicate only at crisis points (after a diagnosis, after a fall). Even if you’ve lost touch over the years and aren’t in the habit of regular communication, do so now for your parent’s benefit. Agree to revisit the care plan you’ve put in place every three months – and mark it in your calendar. Try to avoid side conversations, by phone or in person or via e-mail, in which you make decisions without all siblings involved. It’s normal for some sibling relationships to be closer than others, but in the long run, you need to make decisions regarding your parent’s care jointly. For big questions, such as those regarding legal guardianship or where a parent should live, try to arrange a family conference. If you can’t all be together in one place, arrange a conference call in which everyone can speak on one line. Decide together if in-laws should take part in these conversations or not. Certainly the spouses of caregiver siblings will have insights and opinions worth hearing, since a large burden of care probably falls on them as well. Above all, never criticize your sibling’s efforts. Everybody is doing the best they can in the situation, especially the primary caregiver. The job is tough. If you feel she needs more financial, emotional, or practical support, be prepared to offer it, research it, and arrange it, rather than sitting in judgment. This is especially important if you live far from your parent and from the caregiver sibling. Geriatric care managers note that families hit two of the most common stumbling blocks when a sibling loses touch with the reality of the situation: one, a sibling is in denial about how things are going; and two, a sibling clings to a promise never to institutionalize a parent. Denial over the decline in a parent or the suitability of a care situation can lead to hard feelings all around. A sibling may be perceived as putting up roadblocks to the family’s ability to do what’s best, stirring up guilt and resentment. For this reason healthcare professionals often advise not to promise a parent that you’ll never put them in a nursing home. You simply can’t know what the future will bring. Besides, many facilities for assisted living and long-term care make wonderful homes. By the last stages of the disease, your parent may not really understand where she’s living. When painful differences of opinion occur – or rivalries that have festered for decades erupt – a neutral third party can play the “mom” and restore peace. 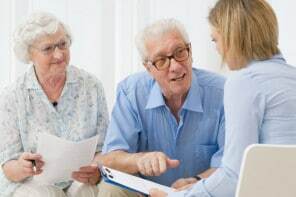 A geriatric care manager is a terrific resource for any family managing a parent’s care, especially considering that the baby boomers facing these issues may have their own families to juggle as well. An experienced professional whom you all trust can make working through snags easier. An important point that was left out: siblings need to be emotionally supportive of the primary caregiver, e.g., call to ask how he/she is doing and really listen to the reply; tell him/her how much you appreciate their caregiving; ask if he/she needs a break. Don’t tell the family caregiver that someone else’s caregiving is more difficult than theirs. Send a card occasionally to lift his/her spirits. Thanks, appreciation, offers of help, emotional support. Without this support, the caregiver is likely to burn out much faster and become resentful and angry. Great point and excellent suggestions! As mentioned in the section titled “Realize that you need one another,” it’s important to support the primary caregiver in a variety of ways to help them avoid burnout.